Starting with drinks, my companion opted for Adams Ale while my fancy was caught by a cocktail titillatingly named Gunpowder ($14). And it certainly lived up to it’s name. Described as being somewhat similar to a gimlet, it was a swirl of gin, green tea, lime juice and citrus laced with an unexpected hint of spices. 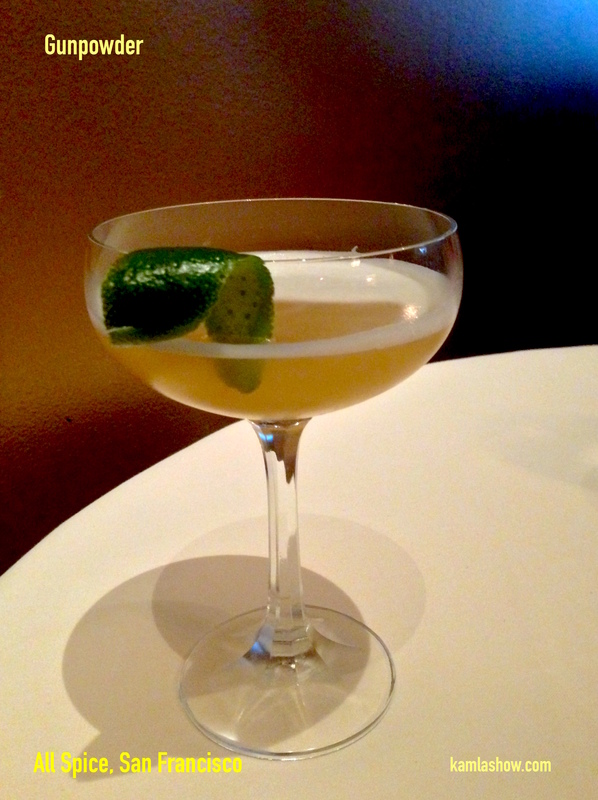 And this gimlet with a South Indian flair brought back memories of idlis, dosas and my childhood in the south of India. Detecting the flavour of cinnamon, I was led to Jason, the bartender, who creates his own special tincture of spices with cinnamon, fennel, star anise, clove, and Siachun peppercorns. He uses a couple of drops of this tincture to infuse his cocktails and the result is an unexpecped spicy twist to the drink. While we were making our choices for dinner, we were invited to taste a cold soup made from wild mushrooms, porcini and truffle cream delicately garnished with chives. 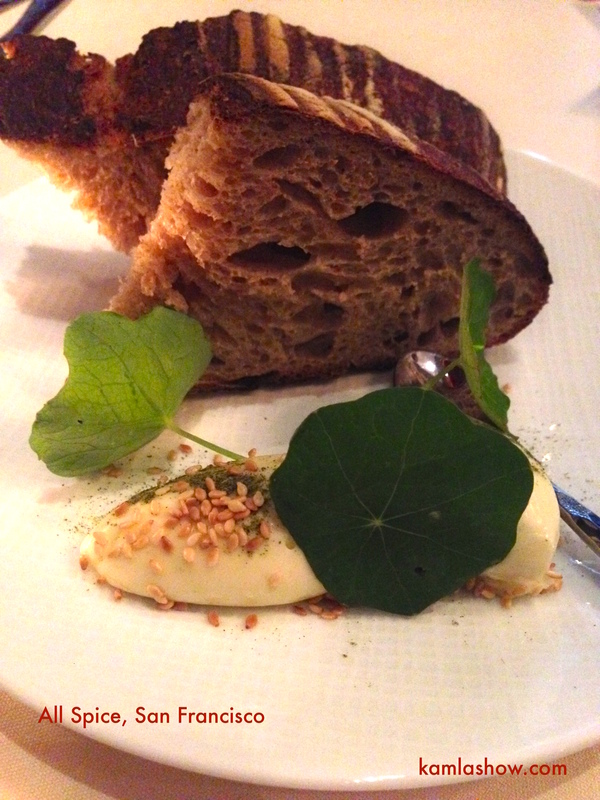 No sooner had we finished our amuse, we were served a freshly baked Levain bread complemented by butter flavored with meyer lemon that proved much too good to resist. 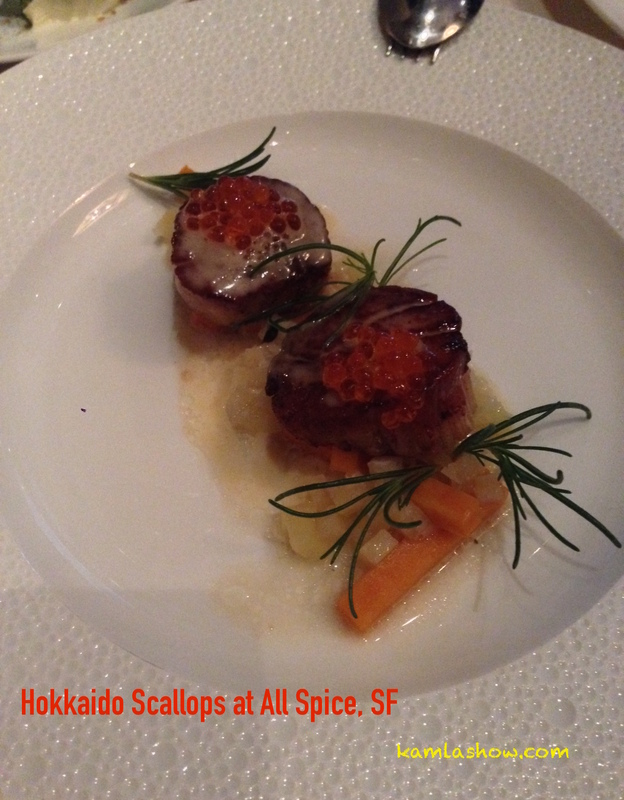 Ready at last to order, we decided to go with the a la carte menu, but could not resist the enticement of the Hokkaido Scallops from the tasting menu ($109).”They are very sweet,” Shoshana replied when we asked her how these scaloops weree different from the others. Chef Chopra indulged our request to taste the Hokkaido Scallops from their tasting menu, where the dishes are paired with wine. This was an outstanding dish that came with gravestone chip, various Caviar and butter emulsion. Sweet and fresh, my friend and I had to agree, they were, probably, the best scallops we had ever tasted. Our next dish was Artichoke, Artichoke, Artichoke ($17)- an appetizer of cold artichokes which was no disappointment either. Distinctively flavoured California, Jerusalem and Chinese artichokes prepared in a green Goddess dressing reminded me of a delicate Indian cilantro-mint chutney; a unique Indian twist to a New American dish. It came with Peruvian potato causa and a sprinkling of pea shoots. 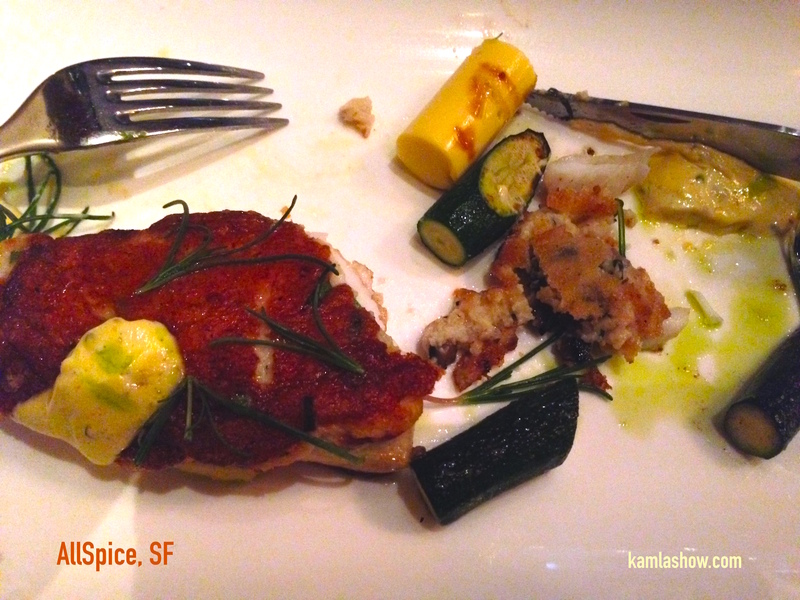 Our two main entrees were fish and fowl – scallop-crusted seabass ($37) with crispy grits, eggplant, summer squash with its flower, anchovy crea, and lacquered squab ($36) with lodi cherries, early corn custard, preserved figs, morels, and a chocolate-olive condiment. The squab being a slightly gamey bird, I opted for the seabass which was perfectly prepared and delicious. We rounded off our dinner with a cup each of Sightglass coffee ($5) and a most unusual dessert of dark chocolate kulfi which we shared. The bottom layer consisted of a macadamia mousse topped with mangoes tossed in lime, chillies and salt, and finished off with a sprinkle of tandoori spiced macadamia nuts. 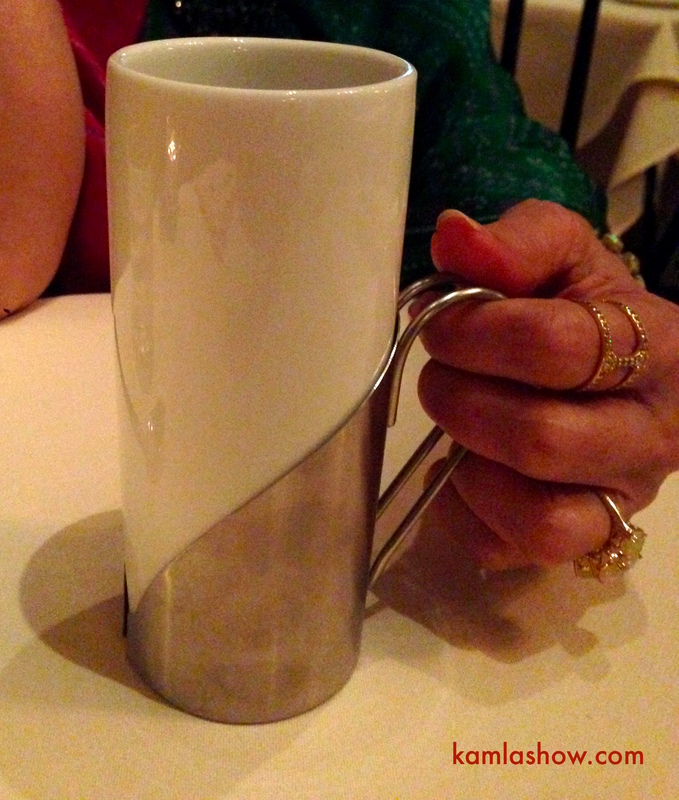 The coffee and dessert was an interesting and unexpected finish to an enjoyable meal and a unique experience. All in all, the entire culinary experience was a delight, enhanced by the warm, caring service of the staff which cannot but bring to mind the service enjoyed in most five star hotels in India. Chef Chopra’s dishes are imbued with the unexpected twist of familiar spices from the Indian kitchen. It is the surprise element in his dishes. The spices do not overpower the flavours of his food; they tend, instead, to excite both palette and mind to untangle the mystery of his combinations. Chef Chopra has succeeded in creating complex flavors that combine the best of East and West. 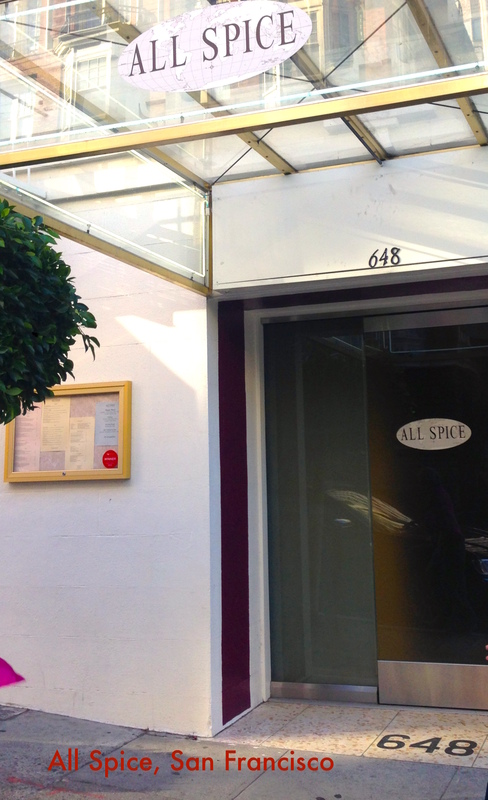 UPDATE: All Spice closed permanently in March 2016.